The fate of Kirkuk’s oil fields… precious metals in Swiss sewage… a reader inquiry that might be on your mind too… and more! “I think there is a major disruption looming,” says Apple’s CEO Tim Cook. For his sake, he’d better hope so. Apple has created a brand with cachet other companies only dream of… but it’s also been accused of being a one-trick pony, stocked with products riffing on variations of its computer technology. On the other hand, “Apple didn’t become the biggest company in the world by mistake,” notes Davis Ruzicka. Davis is one of the young guns in our Baltimore office, overseeing our sister e-letter The Daily Edge. Over the summer, Davis made an outlandish forecast. Only now, three months later, it’s starting to look a little less outlandish. We haven’t shared this forecast with you until today. And we’re still not going to tell you what it is for a few more moments. It’s so “out there” that we need to tee it up with a little more background. Recall that Apple has about $257 billion in its very deep pockets just waiting to be put to use. Davis asserts Apple’s Silicon Valley wizards won’t have to engineer the next big thing; the company can simply buy its way to the top of a new technological revolution. The Tim Cook quote above came during an interview with Bloomberg TV. Clearly he’s hinting at something cutting-edge on Apple’s horizon. OK, maybe it still doesn’t make sense even after we’ve put it in context: Why buy Ford, after all, when Apple could cherry-pick sexier companies like Tesla or Uber? Here’s why: “Detroit is actually LEADING the autonomous tech field, according to new research,” says Davis. “Take a look at this infographic from Navient. 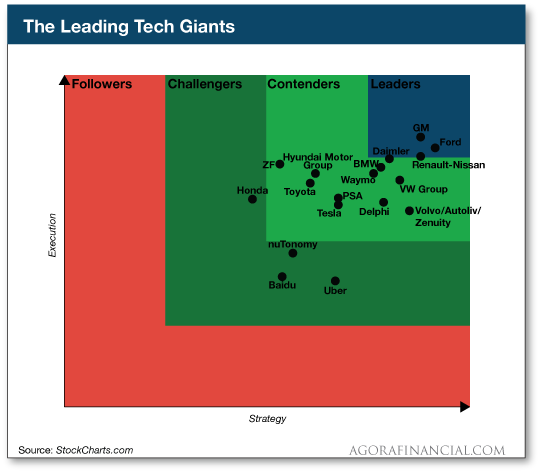 Both General Motors and Ford are leading tech giants Alphabet (who owns Waymo), Tesla and Uber. Our man at the Chicago Board Options Exchange, Alan Knuckman, is noticing some — well — interesting activity in options on Ford shares. His patent-pending “WPI” indicator, the “someone knows something” indicator that we’ve referred to now and then, is going bonkers. Maybe it’s the gangbusters sales of Ford’s F-series pickup trucks — which just registered their best September since 2004. Yesterday, Alan showed his Weekly Wealth Alert readers how to take advantage — by the end of next week. Even if a deal doesn’t come through by that time, he’s pinpointed a trade with big payoff potential. How big? You’ll want to check this out right away. To the markets, where yet again the major U.S. stock indexes are flirting with all-time highs. The Dow is up 28 points at last check, only 15 away from the 23,000 mark. Earnings season is moving into higher gear. The two big investment banks, Goldman Sachs and Morgan Stanley, both delivered “beats” this morning. So did the big health insurer UnitedHealth. Yesterday after the close, Netflix also beat expectations. But even the mainstream can’t help observing NFLX “is sinking deeper into debt in its relentless pursuit of more viewers, leaving the company little margin for error as it tries to build the world’s biggest video subscription service.” Thus NFLX is down nearly 1% as we write. Hey, we know who could rescue NFLX from its debt burden. It’s the aforementioned Apple. If it doesn’t go for Ford, why not Netflix? Since July our Louis Basenese has said Netflix is a logical takeover target for Apple. AAPL needs to make inroads in streaming video, it needs a new source of profit growth, and it’s literally the only company with deep enough pockets to buy NFLX. And even though no deal has come about, Lou’s recommended NFLX options in The Takeover Alert are up 33% in less than four months. Procter & Gamble, meanwhile, says the proxy vote spurred on by activist investor Nelson Peltz — mentioned here yesterday — failed by a margin of only 0.2%. Expect a recount, albeit with no hanging chads. Gold, you wonder? Gold took a spill after we went to virtual press yesterday, thanks to renewed dollar strength. The bid on the Midas metal is back to $1,284. For the moment, civil war has not broken out in Iraq and crude prices are stabilizing, a barrel of West Texas Intermediate still a hair above $52. Kurdish militias put up little resistance yesterday as troops loyal to the central government swept into the city of Kirkuk. And at last word, the Kurds have also abandoned two nearby oil fields to the army as well. There are conflicting reports about whether production has been shut down at those fields, but for the moment traders aren’t in a panic. Once more there’s a disparity between “soft” and “hard” data coming from U.S. factories. The Federal Reserve is out with its industrial production figures for September. The good news is that the hurricanes didn’t have much effect. The bad news is that the 0.3% growth is almost entirely a function of utilities and mining; manufacturing rose only 0.1%, way less than the “expert consensus” was counting on. That’s hard data, in contrast to the soft data from surveys and such — like the Fed’s Empire State survey mentioned here yesterday. At some point, the hard data have got to start catching up with the soft data… or, more likely, vice versa. In other economic numbers, homebuilder sentiment in October is at a six-month high according to the National Association of Home Builders; here too the hurricanes appear to have had little effect. “It’s about time some good news came out of Las Vegas,” says Ray Blanco of Penny Pot Profits. People are still flocking to Las Vegas to “let their hair down,” Ray assures us — and one madman isn’t going to change that. Encouraging news, to be sure — especially for pot stock shareholders. Even more encouraging are the numbers Nevada’s Department of Taxation released for July, the month legalized recreational weed hit the market. According to Marijuana Business Daily, sales in the Silver State are brisk. Compared with the first month of sales in three other legalized-weed states, “Nevada’s sales numbers essentially doubled the sales numbers in the other states,” Ray says, “with more than $27 million in sales. “Recall those sales numbers come in spite of the fact that Nevada faced huge supply shortages due to distributor rules that hadn’t fully been worked out in July,” a bureaucratic snafu we cited at the time. 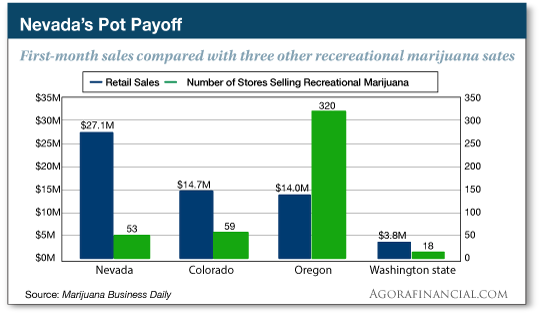 “Nevada managed to pull off that big pot sales number with just 53 stores selling recreational marijuana — less than any other state but Washington during its first month of legal sales,” says Ray. “That’s quite an accomplishment. The precious metals likely come from the watch-making industry since high levels of gold were detected in the wastewater of western Switzerland — the seat of timepiece production. High levels were also detected in the country’s southern region, home to several gold refineries. The metals arrive in sewage sludge (eww) as particulates that are burned up in the wastewater treatment process. Researchers are now weighing the cost-effectiveness of collecting the particles instead. “The levels of gold or silver were very small, in the micrograms, or even nanograms, but when you add them up it’s pretty substantial,” says one. Leave it to the Midas-touch Swiss to turn everything — and we mean everything — to gold… Even their effluence turns to affluence! To the mailbag, and an inquiry after a reader saw this eye-opening message: “Will current subscribers to Technology Profits Confidential be given the Halo-Fi report along with the stock symbol, or do we have to pay for another subscription? The 5: Current subscribers always have access to new reports. Just go to the homepage for Technology Profits Confidential and click on the “Reports” tab. Actually, you can do that with any service you’re subscribed to.